I periodically ponder this question, since I guess that would be the best description of the type of music I like to play, those old songs that people sing when they get together, whether sitting around the campfire, at a party, or in a pub. A quick online search for the term <traditional music> brings up this definition: “music transmitted by mouth, music of the lower classes, and music with unknown composers” (Wikipedia). So this is music of the common folk, marking moments in people’s everyday lives – courting, loving, living, working, and dying. Songs such as The Water is Wide, Pretty Saro, and Red is the Rose. It was mostly passed on orally, with people rearranging verses or making up new words when they forget how the song goes (the “folk process”). For me, traditional music is even broader than that. If you look up <tradition> in the dictionary, you’ll find that it is information that is handed down by word of mouth or by example. In that case, the songs I heard on the radio growing up, songs my mother sang to me (mostly Broadway show tunes), or those silly songs from summer camp can all be part of the tradition. And if you want to hear some great traditional music, whatever your definition, stop by the Tuesday Night Singaround at Golden Link (7:30 pm, Twelve Corners Presbyterian). 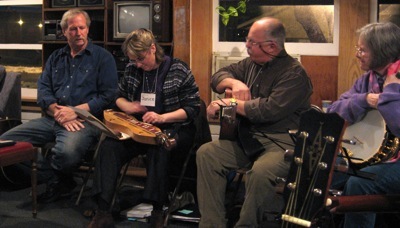 All different kinds of folk songs are welcome – bring a song to share, or request something you would like to hear. Someone is bound to know it. This entry was posted in Synchronicity: Musings on Words, Music, and the Arts and tagged folk music, Golden Link, music, singing, traditional music. Bookmark the permalink.